A recent discovery of an enormous, ancient footprint in Denali National Park is being seen as another indication of how busy the Alaskan landscape was with prehistoric animals coming and going for seasonal food hunting. Anthony Fiorillo is the curator of earth sciences at the Perot Museum of Nature and Science in Dallas. He says the first dinosaur print in Denali was found in 2005. He says that discovery, now on display at the Murie Science & Learning Center was the tip of the iceberg in terms of realizing how much dinosaur activity Denali once contained. “Every year we’ve been going up there and every year we’ve been documenting dozens or hundreds of new localities. 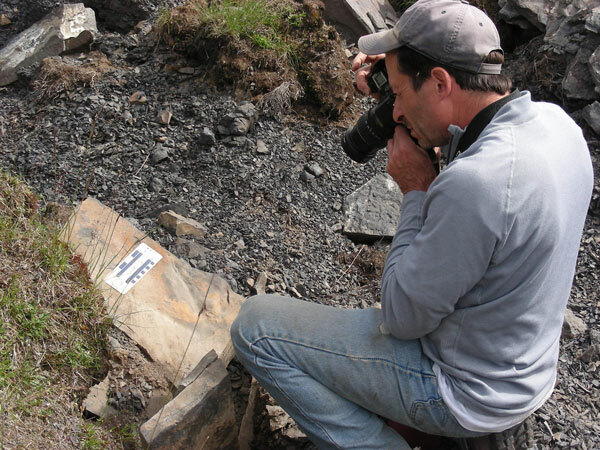 So at this point it’s safe to say that Denali national park actually has thousands of dinosaur foot prints throughout part of the park,” Fiorillo said. Fiorillo says the new find, a Therizinosaur track was beyond Fang Mountain. “Once you cross the sanctuary river and looked to the south side of the road, you would be looking all the way out to Toklat camp and even a little bit beyond that, you would be driving through some of the best dinosaur country, anywhere,” Fiorillo said. Fiorillo says the feathered Therizinosaur was related to both Tyranasaurus rex and the chickadee, with four forward facing toes and peg like teeth suited for chomping vegetation. Fiorillo says the Therizinosaur track will be on display with other Alaska dinosaur finds in the fossil hall at the new Perot Museum of Nature and Science in Dallas. The opening is slated for January 2013.